American Catholic (Image CassiePeaDesigns): Blessed Solanus Casey (1870-1957) Barney Casey became one of Detroit’s best-known priests even though he was not allowed to preach formally or to hear confessions! Barney came from a large family in Oak Grove, Wisconsin. At the age of 21, and after he had worked as a logger, a hospital orderly, a streetcar operator and a prison guard, he entered St. Francis Seminary in Milwaukee—where he found the studies difficult. 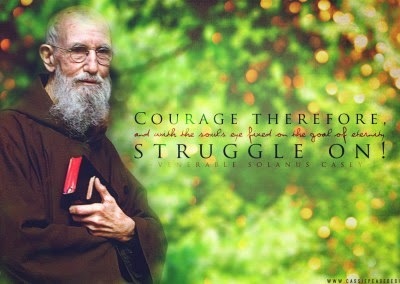 He left there and, in 1896, joined the Capuchins in Detroit, taking the name Solanus. His studies for the priesthood were again arduous. On July 24, 1904, he was ordained, but because his knowledge of theology was judged to be weak, Father Solanus was not given permission to hear confessions or to preach. A Franciscan Capuchin who knew him well said this annoying restriction "brought forth in him a greatness and a holiness that might never have been realized in any other way."